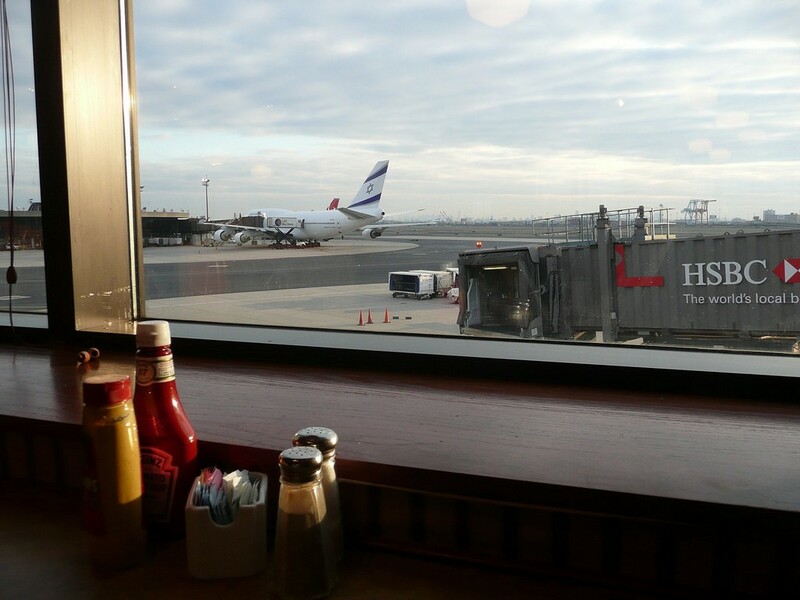 Dining Out on Airline Miles: A Good Deal for Everybody? When airport restaurants let you pay in airline miles, how do you make sure your servers get the tip they deserve? Photo credit: Vige, CC BY 2.0. I arrived at Newark hungry, which is never a good way to arrive at the airport. I usually pack a sandwich and some snacks at home so I won’t have to shell out for overpriced and mediocre food, but that Friday afternoon in June my cupboard was bare. I had spent most of the previous month on a business trip to Asia, returned to New Jersey on Sunday night, and then worked a succession of 12-hour days, with no time for the two-mile walk to my local grocery store. Breakfast that morning had been a pouch of ready-made tuna salad and a string cheese. Through a combination of work and personal travel, plus a United Visa card, I always have tens of thousands of miles in my account. While I had planned this weekend with friends in Indiana months prior, in the meantime I’d accepted a job offer that meant I’d be salary-less and moving in July; I knew I needed to conserve cash. Using a few thousand frequent-flyer miles to purchase what I anticipated would be a sub-par meal sounded like a good deal. Lured by the description of the kale salad on the menu outside, I grabbed a seat at the bar in Abruzzo’s Italian Steakhouse. I picked up the iPad resting on a stand in front of me and scrolled through the menu; sure enough, the price of every item was listed in both dollars and United miles. An ad at the top of the screen announced that I’d get a 20 percent discount at checkout if I chose to pay in miles. It was almost too easy: I selected the kale salad (1,660 miles, with the discount) and the next screen suggested that I might like a diet Coke (400 miles) with it. Sure — what’s 400 miles? Knowing that after I landed in Indianapolis I faced a 90-minute drive, I added a half-order of the penne with vodka sauce (1,140 miles). I expected that at some point I’d be prompted to enter a credit card so I could leave a gratuity, but no; I simply signed into my United account and confirmed my food order. No problem. I would just ask my server if she could break the $20 in my wallet for a tip. A second later, however, my phone buzzed with an email containing my receipt. Opening up the message, I saw that United and Abruzzo’s had already taken care of the tip: on top of the 3,200 miles I had spent on food, the restaurant had automatically added 230 miles for tax and another 570 for a gratuity. As I ate my over-dressed kale salad and under-cooked penne, I wondered if a tip of 570 frequent-flyer miles was enough for my friendly and efficient server (whose name I regrettably failed to write down and now can’t remember). What was the conversion rate? How often were the tips paid out? Should I still get change for my twenty so I could leave a few actual bills and ensure that she’d see real cash that day? What’s the etiquette when you’re paying with miles, not dollars? Finishing the last sips of my diet Coke, I decided that a forthright approach was the only way to get some answers. I waved the server over. She smiled and assured me that yes, she would get tipped for serving me. I stumbled over my next question. “Yes, yes, it’s fine,” she responded, and thanked me for asking. “Okay, well, I just wanted to make sure that it’s fair to you … because it seems like … paying in miles … I wasn’t sure how it worked …” I am doing this badly, I thought. I wanted to talk more, ask more questions, reassure myself that she wasn’t just saying what the restaurant required her to say. But it was busy and I knew that she needed to move on from my awkward probing, so I just said thank you and picked up my things to go. I’ve thought about that airport lunch a lot in the past two months, and I’ve decided that I should have left a cash tip, regardless of what my server said. For me, paying with miles wasn’t a bad deal; I’m not saving them up for anything specific, and I knew I needed to conserve cash given my upcoming job transition and move. I won’t miss the 4,000 miles my lunch cost. But I wonder if the exchange rate for miles yielded a tip as large as the one I would have left if I’d paid with real currency (I tend to do 20 percent and then round up to the nearest dollar). Did I shortchange a server in the interest of conserving my own cash? I suspect the answer is yes. United might want us all to start paying with miles, but I’m not sure it’s a good deal across the board. Maura Elizabeth Cunningham is a historian and writer based in Ann Arbor, Michigan. I Guess I’m Wealthy? Weird.